Slack is a cloud based collaborative software which enables organizational communication through its persistent chat rooms (channels), private groups and direct messaging features. Every customer and subscription related notification such as sign ups, trial conversions, payment updates, cancellations etc will be notified to you through Slack. You can download the Slack mobile application and receive notifications on the go. The team owner and the Admin alone have the rights to set up the integration. The team members can sign in but cannot proceed with the configuration. 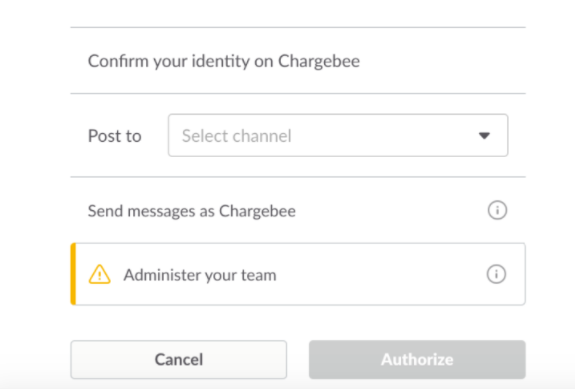 You can set up your Slack account in Chargebee by navigating to Settings > Third Party Integration > Slack. You can now connect to your Slack account from the Chargebee site. Notifications are received from Chargebee through the allocated channel. You can choose the events you want to get notified about, such as when a customer signs up, when payment fails, when invoice is sent for the first time etc. Your integration is now complete. Notifications related to your subscription/payment updates will be sent to your Slack channel as and when they occur. Manage Notifications option takes you back to the Pick what you'd like to be notified about section where you can set your notification preferences. You can choose to disable Slack in your Chargebee site by clicking on Disconnect. The connection gets disabled and you will no longer receive any notifications from Chargebee. Which plan of Chargebee is Slack integration available for? The Chargebee - Slack Integration is available on all plans. What happens when Slack account is disabled/inactive or when a channel is removed/disabled in Slack? In such cases, the sync will stop and a failure email will be sent to the Chargebee site admin. Is it possible to get a consolidated report of all the events occurring at your Chargebee site through Slack? Integrating your Slack account with the Chargebee site enables you to receive a daily report which contains the details of your performance metrics from the previous day. You can choose to receive this report by selecting the Daily metrics about subscriptions, activations, payments, receipts option while setting your notification preferences.